Season-associated environmental factors have been related to the onset of rheumatoid arthritis (RA) and the severity of joint complaints.1 ,2 A recent study demonstrated that the onset of arthritis symptoms during winter or spring was associated with more radiographic joint damage after 1 year.3 This led us to evaluate the influence of the season of symptom onset on long-term radiographic progression. Six hundred and eighty-eight RA-patients, from the Leiden Early Arthritis Clinic (EAC) and 830 RA-patients from the Swedish BARFOT-study were included in the study.4 ,5 These cohorts were similar in the percentage of women patients, age, symptom duration, swollen joint count, C reactive protein and the percentage of anti-cyclic citrullinated protein antibody positive patients (data not shown). During a follow-up period of 5 and 7 years, a total of 6990 hands and feet x-ray sets were obtained and scored for joint damage according to the Sharp-van-der-Heijde method ( all ICCs >0.9).6 The majority of patients were recruited at a time when early aggressive treatment was not the standard. Hence, treatment effects were supposed to be limited. Seasons were defined meteorologically: winter from 1 December to 28 February, spring from 1 March to 31 May, summer from 1 June to 31 August, and autumn from 1 September to 30 November. Longitudinal x-ray data were analysed, adjusted for age, gender and treatment, using a multivariate normal regression analysis, with the radiographic score as a response variable. In both cohorts, there was a greater proportion of RA-patients that reported their first symptoms in the winter when compared with the other seasons. This was significant in the Swedish cohort (p=0.005), but not in the Dutch cohort (p=0.56) (figure 1). However, the radiological progression rates over time were similar in the four seasonal groups in both cohorts (p=0.29 in the Dutch and p=0.46 in the Swedish RA-cohort) (figure 2). In addition, when studying the effect of winter and spring combined, no significant differences were observed (p=0.13 and p=0.47). Percentage of rheumatoid arthritis (RA) patients with symptom onset in each of the seasons in Dutch RA patients and Swedish RA patients. 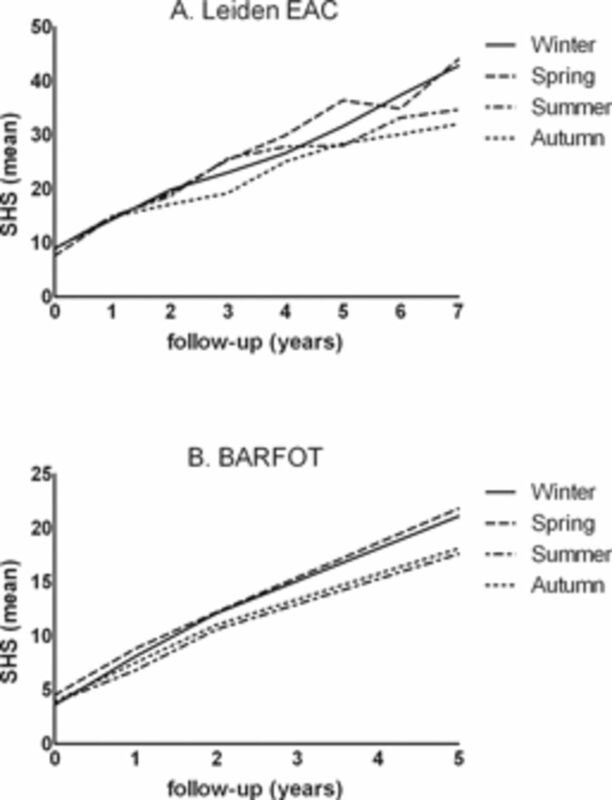 Effect of meteorologically defined seasons on radiographic damage progression over 7 years of follow-up in Dutch rheumatoid arthritis (RA) patients (A) and Swedish RA patients (B). To evaluate the discrepancies between our findings and those published by Mouterde et al, we asked the French group for their definition of seasons. In their analyses, winter started on 1 January, which is dissimilar from a meteorological or astronomical definition of seasons. By this definition, an association between the winter and joint damage was observed in the Dutch RA-patients (p=0.02) but not in the Swedish RA-patients (p=0.89). Considering the overall negative comparisons and the number of the tests performed, the results obtained in the Dutch-RA patients could be a consequence of multiple testing. Earlier studies indicated that seasonal factors may relate to both RA-onset and short-term radiographic severity.7 ,8 Our results do not convincingly demonstrate that RA-onset is more frequent in winter, but there was a tendency towards such an effect. Often, there is an interpretation of observed seasonal influences, such as RA may be triggered by viral infections or lower vitamin D levels. Given that vitamin D levels are lowest at the end of winter, and that vitamin D levels are presumably lower in the Swedish than the Dutch population, and the effect of winter on RA onset was more pronounced in Sweden than in the Netherlands, it is tempting to speculate about the role of vitamin D on RA onset. However, other explanations are also possible. Importantly, if winter-related pathogenic factors affect the onset of RA, they do not seem to affect long-term disease severity. Since the RA-patients studied were included during a period when early and aggressive treatment strategies were not standard, treatment was not target-driven and analyses were adjusted for treatment effects, it is unlikely that our findings are falsely negative due to treatment effects. In conclusion, when defining seasons meteorologically, seasonal factors at disease onset do not affect long-term radiographic joint damage in RA. This work is supported by grants of the Swedish Rheumatism Association and Dutch Arthritis Foundation. The work of AvdHM is supported by the Dutch Organization of Health Scientific Research and Development.
. What's in season for rheumatoid arthritis patients? Seasonal fluctuations in disease activity. Rheumatology (Oxford) 2007;46:846–8.
. Vitamin D endocrine system involvement in autoimmune rheumatic diseases. Autoimmun Rev 2011;11:84–7.
. Predictors of radiographic progression in the ESPOIR cohort: the season of first symptoms may influence the short-term outcome in early arthritis. Ann Rheum Dis 2011;70:1251–6.
. Predicting arthritis outcomes–what can be learned from the Leiden Early Arthritis Clinic? Rheumatology (Oxford) 2011;50:93–100.
. Methodological issues in radiographic scoring methods in rheumatoid arthritis. J Rheumatol 1999;26: 726–30.
. Onset, early stages, and prognosis of rheumatoid arthritis: a clinical study of 100 patients with 11-year follow-up. Br Med J 1973;2:96–100.
. Early rheumatoid disease. I. Onset. Ann Rheum Dis 1976;35:357–60. Contributors AvdHM, TWJH and BS collected the data. DPCdR, BS and MLEA performed the statistical analyses. DPCdR wrote the first version of the manuscript. All authors reviewed and approved the manuscript. Ethics approval This study was approved by the local medical ethics committees of both cohorts (Leiden EAC and BARFOT).